Love Brooks' style. Those booties though! A couple weeks ago, Adam and I made the short jaunt up to Lawrence at his sister Belinda's invitation for an author event featuring Geraldine Brooks! Since starting her career as a journalist, Australian-born Brooks has led an interesting life, traveling to some of the most dangerous places in the world (she was once jailed in Nigeria, suspected of being a spy). After she had children, she switched gears and became a novelist, which she's also pretty good at—she won a Pulitzer for her novel March. 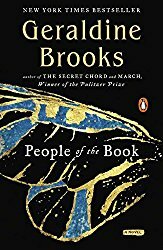 I had never read any of Brooks' work before, so in preparation for the event I read her debut novel, Year of Wonders, and another novel from 2008, People of the Book. I really liked both, but between the two, I connected more with the main character in Year of Wonders, a woman in a small village in 1666 that becomes the epicenter of a plague epidemic. It was fun to read something so outside my normal fare, and despite some stomach-churning childbirth scenes (I'm definitely not cut out for the health-care profession) I couldn't wait to see what would happen (or who would get infected) next. In the interview, Moriarty focused primarily on Brooks' most recent novel, The Secret Chord, a retelling of sorts of the Biblical story of David. The depth of research Brooks does is daunting to someone like me who would rather read fiction than ancient texts, but her enthusiasm for her topic and the admittedly juicy nature of the story intrigued me. I've been a little slumpy in my reading life lately, so I wasn't ready to attempt a third book by the same author right in a row, but The Secret Chord is definitely on my list of books to read in the future. Brooks' writing is just so smart—so well-researched, with such lovely, precise prose—I know I'm going to return to her again. She also mentioned her next book is going to be about a horse(! ), which I am already 100% on board for. One of the reasons I so love attending author speaking events is that the level of discourse soothes and encourages me. People who write novels for a living tend to have a very deliberate way of speaking that illuminates their intelligence. When the sound bites on the news appeal to the lowest common denominator (and the lowest total brain cells), it is so heartening to me to listen to a person speak in not only full sentences, but lovely, thoughtful paragraphs. (I also thought it was really cool how Moriarty, the interviewer, never once interrupted Brooks. It was surreal, you guys.) Sometimes I worry that we have lost the ability to engage with serious issues in a meaningful way, and knowing that people like Geraldine Brooks exist and are working away in this world makes me feel a teensy bit better.